"Thank U, Next" is the lead single and title track from Ariana Grande's fifth studio album with the same name. It was released through Republic Records. The song was written by Grande, Taylor Monet Parks, Victoria McCants and its producers Tommy Brown, Charles Anderson and Michael Foster. "Thank U, Next" is an self-empowerment song that mentions many of Grande's past relationships. Grande gave the first televised performance of the song live along with her single "Breathin" on The Ellen DeGeneres Show on November 7, 2018. 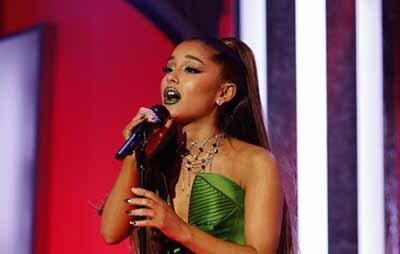 Following the worldwide release of "Thank U, Next", the song debuted at No. 1 on the iTunes Worldwide Song Chart and reached No. 1 on US Apple Music, becoming the first pop song to do so in 2018.